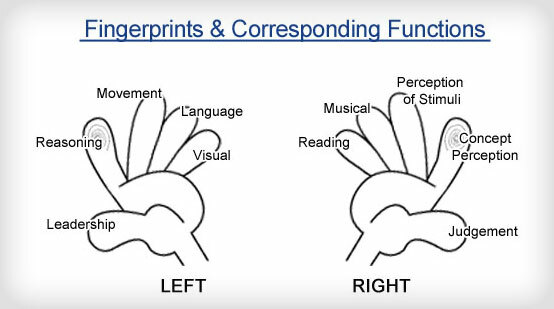 Types of Fingureprint- Way2Brain DMIT Pvt. Ltd.
A cognitive learner learns by inspirations which are mainly comprehended by yourself. You’re goal oriented, self-demanding. It’s easy to have subjective cognitions, which need to be modified by logical reasoning and evidence. An affective learner learns by imitations. You have strong imitative and creative abilities, but you learn both good and bad things. Environments play important roles for you. You value the relationships between friends. A critical thinking learner has advantages in careful observations, logical ability and critical thinking ability, which help you learn by reverse reasoning. Searching for differences, you wish to have an unique personal style. You tend to do things without concerning others. A reflective learner learns like a sponge. You can comprehend something thoroughly and apply it practically with continued repetition of practice. You learn well in situations that enable you to follow a particular path. You learn better when there’s someone to lead, teach and remind you. Simple Arch - Simple, settled, practical and stubborn. Tend to have things done by steps. Repressive of emotions. Arch on left thumb- need security, step-by-step, transparent interaction, no secret, punctuality, principal, slow, infinity learning skill, need to have confirmation, skill and professional, specialized in whatever they do. Arch on the right thumb- patient, simple life, law-by-law, don’t like changes and firm. Arch on index fingers – may indicate a practical approach. Arch on middle finger – evidence the practical employee and the otherwise intellectually oriented person. May prefer simple physical task. Arch on ring finger – indicate the artistic interest, maybe represented through craftsmanship, love dance, simple arts. No mention of arch on little finger. Indicative of a searching intellect, one might excel in creative fields that require abstract thought, such as medicine or science and have good memories. Have simple arch characteristics. Doing things very easily inconsistent, nervous activity and subject to high strung. Sigh of enthusiasm and easily responsive to emotional stimulation. Find them naturally affected by musical tunes (melody). Everyone gets on well with person whose fingerprints are mainly loops. They have good communication skills and all round capability. The loop fits the adaptable, easy going, flexible, middle of the road personality with wide abilities, who fits in, seriousness and humor. Ulnar loop – are better at plagiarism of assets and ideas of others, who can see the talents or shortcoming of others better than their own. They suffer slow or dull thinkers badly, have too wide ranging interests and short attention spans. Have adaptable personality and flexible outlook. Able to perceived loop holes and work towards personal goals or goals of others. Will lose sight of personal aims when goal is in sight and are more open minded. Mild manner, happy people, moderate personality, lack passive in interaction. Have some of ulinar loop characteristics, with free flowing ideas and abilities to improvise. More individualistic especially with loop found on the index finger. Much less adaptable and flexible than those of ulnar loops. Seldom can retain all information they have gathers. Most are self centered, love reverse operation, unknown of their next action. Have good quality in leadership, good judgments. >RC15 very creative, indecisive and easily influenced. caring humanitarian, good visual memory. outstanding, not necessary be at the top, good perception, fast imagination, direct or straight to the point. No patient on long explanation. Like to ask question, victim in education because always ask impossible question. Those with loops an all fingers accommodate and survive in troublesome situations. While they appear to be weak, they will fiercely protest if backed into a corner. Found to have 6 or more loops for fingerprints were adaptable, had both mental and emotional elasticity, easy going and perhaps a little too responsive to other’s mood. Versatility fights concentration in this person. Goal Oriented, very aggressive, decent and serious about images. Emulous with strong self consciousness and eager to win. Independent, very individualistic, freedom seeker, self -motivated, secretive. On left thumb, very strict and no humanitarian, request high. On the right thumb, strength, look towards goal, precise, want face, not easily influenced, very straight forward with their decision, fight very hard for goal setting, want beauty, easily hurt others feeling, say whatever they feel. With surging personality characteristics, easy to grasp goal, but also likely to have emotional reaction. Goal oriented, aggressive, decent and serious about images. Emulous with strong self-consciousness and eager to win. On a weaker strength. Goal oriented, aggressive, decent and serious about images. Emulous with strong self consiousnessand eager to win. Focus on precision and details with carefulness. Very accurate. This is rare print. People with this have trouble making up their mind (hence indecision) and are difficult to deal with. Multiple objectives, tendency of the characteristics of systemic thinking.Practical type, good judgement but lack common sense, too materialistic and lack consideration for the emotional aspect of life, lack the understanding or appreciation for the ideal visions or plan of life. Such person also lack mental elasticity and are everywhere narrowly limited.